"I always feel the desire to look for the extraordinary in ordinary things; to suggest, not to impose, to leave always with a slight touch of mystery in my paintings."" An unusual figure in the history of 20th century painting, Balthus both traveled among and drew upon the work of other major artists of his time, while at the same time following a unique individual trajectory. He was mentored by, friends of, and/or even collaborated with seminal creative figures from different eras, including Antonin Artaud, André Breton, and Rainer Maria Rilke, while cultivating his own highly refined style of painting. The scenes he usually depicted were very ordinary bourgeois interiors or outdoor settings, which nonetheless managed to reveal the heightened inner states of his subjects (often young females) as well as the states of mind of those who might be viewing them. Balthus's work demonstrates a commitment to classical painting while applying those techniques upon subject matter that reflects the concerns of the modern era in a highly restrained yet nonetheless often charged manner, revealing signs of sexuality, social transgression and anomie. His channeling of the concerns of numerous thinkers and practitioners from other creative disciplines included the distillation of ideas and attitudes from individuals and artistic movements. Some ideas included renderings of exceptional psychological states and licentious interpersonal encounters. Balthus's often disturbing imagery brings to the fore questions of propriety of displaying such works in public museums. His blatant violations of taboo topics were acceptable in the context of the French libertine avant-garde, but are now deemed improper by liberal-minded audiences. His work in set design for stage production in ballet, opera and theater informed his own narrative ability to impart dramatic trajectories to the scenes he portrayed in his paintings of ordinary settings. His investment in figurative image-making helped reinforce the value of representational painting as a critical force in a century which saw many artistic movements turn toward abstraction. 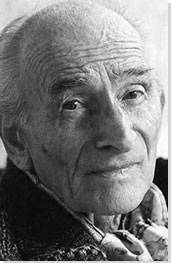 Balthus (originally named Balthasar Klossowski) was born in Paris, France to an artistic family; his father was a prominent art historian and his mother was a painter. He was exposed at an early age to the arts and social scene in Paris at the turn of the 20th century, including his mentor (and his mother's lover) the celebrated poet Rainer Maria Rilke. His older brother Pierre was also a noted artist, author, philosopher and translator, whose own circle of acquaintances and influences included Georges Bataille. Bataille's interest in transgression - including ideas of sado-masochism studied in the work of the Marquis de Sade - would certainly have swirled around Balthus by way of his brother. In this scene of urban life, a tableau featuring a larger group of individuals than the more intimate couples or single individuals he usually painted - can be seen as his setting in the modern era the sort of outdoor group scenes rendered allegorically by early painters such as Breughel and Bosch. He updates this depiction of shared - or parallel -- sociality by combining the enigmatic affects, stiff postures and heightened atmosphere of Surrealism with a classical composing of figures in architectural space. For the latter, he draws on some of the techniques established in Renaissance-era painting, with carefully laid out proportions for each element, and the foreshortening of the individual figures at their different degrees of depth in a vanishing perspective for the viewer. He offers a more refined take on some of the ambiguous portraiture than his German contemporary Otto Dix produced around this same time, or the group tableaus in modern spaces that Max Beckmann was also rendering. This is a prime example of how his symbolic works triggered discomfort in some viewers, and it is a prototypical - if not the ultimate - example of his use of young girls in his paintings. With the exposed lower body of a prepubescent girl and hints of a sexual dalliance with the woman on whose lap she lays, this piece was first displayed at one of his early Paris shows, but hasn't been exhibited in public since it was last shown in New York in 1977. While the title quite literally can refer to the guitar in the foreground of the composition, he is using it in a more symbolic way - the sitting woman has her arms and hands positioned as though playing a guitar; here, though, the guitar is the body of a young girl. This work also comments on roles of authority and dominance; the young girl is submissively draped over the woman's lap, and her face and limp arms imply little agency, though the girl's hand reaching up to hold on to the somewhat disheveled woman's exposed breast suggests an ambiguity of both pleasure seeking and a more conventional succor of daughter from mother in the image. Conversely, the seated woman is in control of the entire situation, and her face and downward gaze imply dominance over the limp girl. Here, even the draped pose of this painting references historical works that preceded it; the lifeless body of the girl in the lap of a woman mimics the many versions of the Pieta. While Michelangelo's Virgin Mary looks down lovingly at her dead son, the woman in this painting has a less emotional, more studied gaze, more predatory than loving. Similarly, Christ's lifeless face is shown looking upward, towards a symbolic father/heaven, while Balthus's girl looks out to nowhere, uncertainly lost in the ambiguity of the situation. Reflecting on the fact that Balthus was raised in a creative household, it is not surprising perhaps that he might challenge the limits of customary moral acceptability through a traditional, figurative genre. 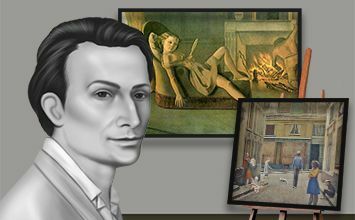 As New Yorker magazine art critic Peter Schjeldahl writes: "Balthus sticks us with a moral conundrum, because he can. His elegantly nuanced violations of taboo won for his conservatively figurative art enthusiastic esteem in the largely Surrealist, devoutly libertine Parisian avant-garde of the nineteen-thirties, and secured him a lasting place as one of the 20th century’s greats." This is one of his earliest works, hinting at a later use of landscape in his paintings, and it is a prime example of how the subject was far less important to him than the scene. While the woman in the foreground is ostensibly asleep, she has her cane draped over herself, hinting at either injury or a need for protection while she rests. The landscape is clearly the focus of this work, yet it is interesting to consider how he uses the natural features of mountains, valleys, and hills to mimic the curves of the sleeping woman's body. The rolling hill in the foreground has a soft mound of flora at its peak, and behind it jagged mountains meet in soft, split valleys. One thing to note in relation to the work's title is that while summertime is hinted at in the lush greenery and clear sky, there is also a somewhat desolate darkness to the scene represented in the work that is opposed to the sunnier climate usually associated with the season. Though the woman is able to nap outdoors, she nonetheless presents an enervated, pathetic figure in her posture, and with her use of her cane as an oddly rigid and uncomforting swaddling, rather more a potential instrument that could be deployed quickly as possible weapon of protection if needed. Balthus's early paintings were often studies of his neighbor Therese Blanchard, a young girl either featured alone or with her cat. With her hiked up skirt and open pose, the Therese in Girl and Cat (1937) demonstrates a sensual knowingness far beyond her young years, and she channels ambivalence about both herself and the situation she finds herself in. Her eyes seem to return the viewer's gaze in a challenge, but they also look slightly off center, as though the girl's uncertainty belies her apparent show of confidence. At the same time, this gives the painting a sort of moral ambivalence: is the viewer voyeuristically observing a private moment or does her pose indicate that she is meant to be gazed at? Given the time period and the modern focus on the disenfranchised modern man after World War I, this young girl and her ennui can hint at the artist's attempts to reconcile modern themes of concern with alienation through a more classical figurative painting style. The cat on the other hand, looks off to the distance, hinting perhaps at another presence in the room. While he sits as sentinel to his young nymphette mistress, he too expresses ambivalence about what is happening in the room. The entire scene suggests disaffection, where every actor plays his or her part, while still only half-comprehending what the larger dynamic of social relations here implies. This is an excellent example of how he used formal conventions and techniques to create a theatrical setting for his work. For one, the title gives the work a narrative momentum from the outset. We as viewers are unsure whether the subject is wounded, ill, or dead, or if she has been a victim of some other intensive depredation of her body, but her full nakedness does not reflect the sensuality of some of his other depictions of nubile young subjects. It is interesting to think of this work as one of his explicit attempts to put the onus of interpreting an artwork more fully on the viewer. While the title of the painting does offer a framework in which to view the scene, he is aware that viewers will likely see the work before perhaps encountering the title. That experience could be a potentially jarring experience if a viewer's initial "read" of the scene might suggest sexuality, which then becomes transmuted into a piece about pain. This work was created the year after Girl and Cat, and towards the end of the period during which he painted Therese. While this girl is in a similar pose to the earlier work, there is a heightened sense of agitation for the subject in the composition. Her eyes are closed and face turned away from the viewer. Therese's body is more defined as an adult; her legs are longer and her face and arms have shed their prepubescent extra weight. Overlapping the title's indication of dreaming, her facial expressions suggest the mixture of possible ecstatic pleasure and an uncertain, uncomfortable or even pained response to unwanted shared sensual experience. Here, even the cat assumes a different role, no longer a would-be stalwart sentinel but now a predator, albeit a domestic one, intently and sensually lapping at the bowl at Therese's feet. The heightening of both the sensual experience depicted and the ambivalence of its subject may hint also at the impending loss of innocence in the painter's relationship with Therese at the time of the piece's production, as the following year he ceased painting her. Balthus did not just paint young girls and cats; he also created portraits of his friends, some of the most notable cultural figures of the early-20th century. This portrait of Pierre Matisse, son of the painter Henri Matisse, who ran a successful gallery in New York City, points to both the personal and business relationship the two men enjoyed with one another. In many ways Balthus's career in the US is attributable to Matisse's promotion of his work, as after his 1938 solo show in the gallery he began to be more of an international name. True to his style, he represents Matisse in a traditional oil portrait, but with small interventions to impart a larger meaning to his subject. Perhaps commenting on Matisse's business abilities in New York, he has painted him in a relaxed posture typical of portraits of American businessmen, despite the fact that Matisse was more traditional in real life. Similarly, he has given his subject a flashy tie and bright socks, again giving the character in the portrait a different personality from the model in real life. He has essentially used the scene to generate a character, despite its model being a friend. As this was given as a gift to Matisse (who later left it to the Metropolitan Museum of Art in New York City, along with The Guitar Lesson - which was later returned to the gallery, unshown, perhaps due to its subject matter), it is possible that the subtle changes in his portrait of Matisse were meant as an inside joke between the painter and his dealer. This later work of a younger woman is mellow in terms of its interpersonal intensity but nonetheless represents a psychological state more akin to the romantic sublime, while incorporating more of a landscape element, influenced by his relocations to the French countryside and Switzerland. Girl at a window (1957) features Frederique Tison, a young woman who modeled for him at the time. In this softer and less tightly controlled approach to image-making with paint, even his brushstrokes seem to be influenced by rich atmosphere of the outdoor surroundings. The model - fully dressed - has her back to the viewer, but absent is the blatant sexuality of some of his earlier works. Instead, the young woman's innocence is insinuated more by the massive scale of the natural and interior elements in which she is immersed, as well as her attentive but essentially relaxed posture. While her arm size does not indicate that she is especially young, her figure nonetheless seems muniscule compared to the window at which she stands, and one wonders if her arms could even reach at the catches to open or close such a window. He has created a narrative and thematic intensity simply through his placement of subject and scene. The flattening of the landscape outside the window also allows his portrait to hint at a vaster expanse of land that spreads far beyond the walls surrounding the property, extending the dwarfing scope of the world laid out in front of the girl, in this mid-century straddling a simultaneous portrayal of interior and exterior states while evoking youth on the edge of leaving a protective sanctuary.